Here is the finished fire pit being used to burn debris. I moved to this little plot of land I own about ten years ago. Living here in the country was a dream I’d had for many years, and during those years of dreaming and planning, I read tons of books about living in the country. The people who make their living off the land, who know how to build things, plant things, and make do with what they have are my heroes. As a child I enjoyed reading the Little House on the Prairie series of books by Laura Ingalls Wilder. Then I read them to my daughters, and now I’m reading them to my granddaughters. In the book I’m reading to them at present, Pa Ingalls is building a house—by himself. He cuts his own logs, hauls them, hoists them up the wall as it’s being constructed, splits the shingles for the roof, hauls rocks for the chimney and constructs that. I am still so impressed by that type of ability. By the time I was able to get my little plot of land, I had my retirement income secure. I did not need to make a living here. And the land I was able to afford is not farm land. It is hilly and rocky and mostly covered with trees. But I wanted to try all those skills I had been reading about for years. I have managed to grow some vegetables each year on the land that has been cleared. And to harvest the black walnuts and blackberries that grow wild. I have learned to fell a tree (a small one) and to cut firewood. To split kindling and make green tomato pickles. 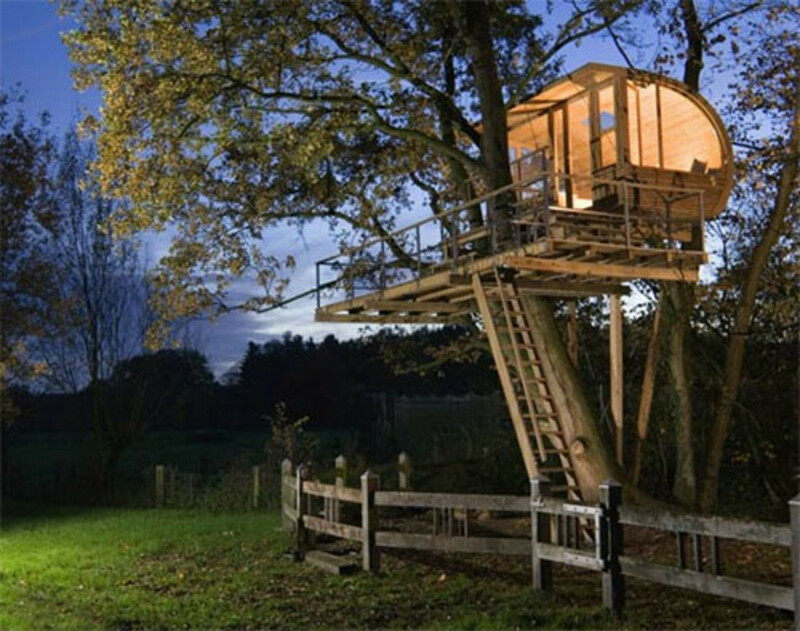 To hang my clothes outside to dry and build a good fire in the fireplace. Book by Helen and Scott Nearing, the guru's of sustainable living. I’ve tried to put the lessons I learned in all those books I’d read to good use. In one these books, The Good Life by Helen and Scott Nearing, I read about slipform stone building. The Nearing’s are the gurus of the sustainable living lifestyle, beginning in the 30’s when they left their home in the city to live off the land. They built their home using the slipform method. 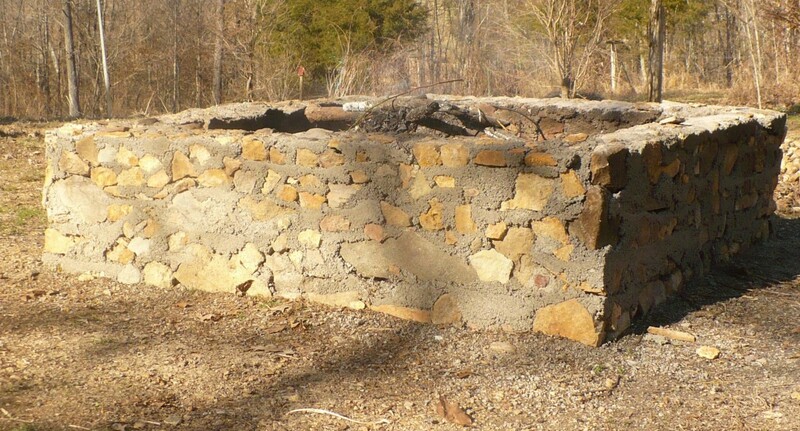 They also built garden walls and other structures. In their books they gave a brief discussion of how they did this. I always wanted to try it. When I was building this home, after the initial push out by bulldozers to clear the land, I (with a little help) did most of the other clearing myself. During this process of clearing off the land, I picked up many, many rocks. For a long time they were just a pile of rocks, mostly small ones, where the grandchildren liked to play. 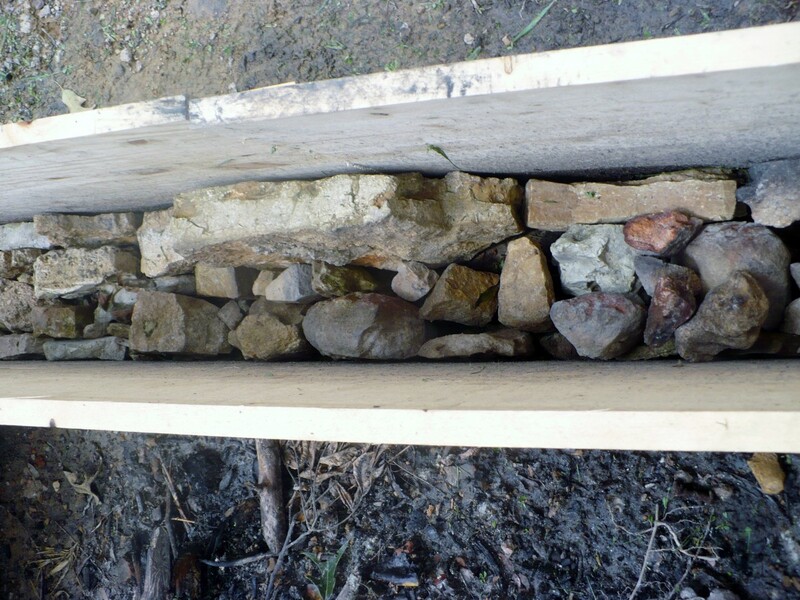 Last summer, I decided to use that pile of rocks and the information I had picked up about slip form rock building to build a fire pit. When I first began planning to live here on this plot of land I thought I would be living here by myself. I had been divorced many years and my daughters were grown. They applauded my efforts all the way, but I was in this by myself. About the time construction of my house began, however, I met someone to share things with. He too was retired, but he was living in the city in a condo (Ugh!) and planned to spend his retirement playing golf and attending all of the home games of his favorite college team. He was here to help me during the construction process, and we were married just before we moved in. He’s always game to help with the many projects I come up with, and was here to help me with this project. He still plays golf regularly and attends all the home game of his favorite team. The first thing I did before beginning this project was to go back to the Nearing's book to read the instructions there. These instructions were not very clear to me, so I also looked online for information about the process. Nothing I found had all the information I needed because none of the projects were exactly like mine. But I took the information I had learned and improvised to come up with a plan that I thought would work for us. First we chose a place in the yard that we had already been using for campfires and leveled the site. Next we staked out the corners for the pit. The outside dimensions of our pit are 62 inches by 62 inches, but this can easily be adjusted. The inside dimensions are 48 inches by 48 inches. Our walls are thick enough that we can sit on the edges to roast marshmallows or hot dogs. 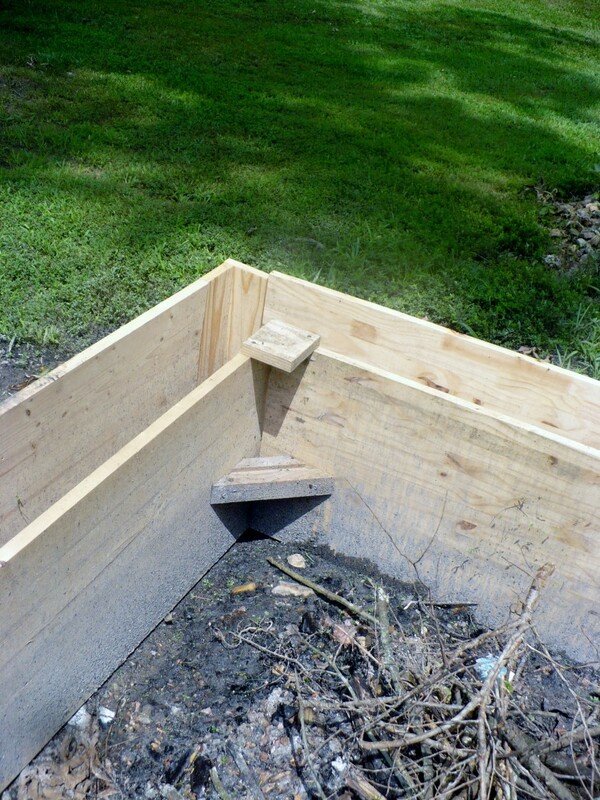 First we built the inside frame and came out the desired length and built our outside frame. 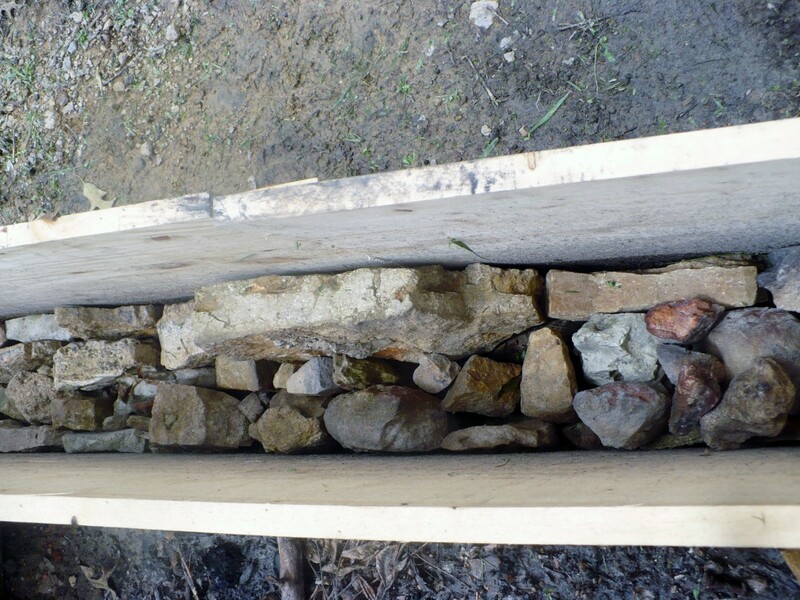 After the frame was constructed, we put in a layer of rocks on the ground. Then we put a sack of Sakrete in a wheelbarrow, added water according to the directions, and shoveled it over the rocks in the form. We kept repeating this process all the way around the form over and over until the frame was completely filled in. 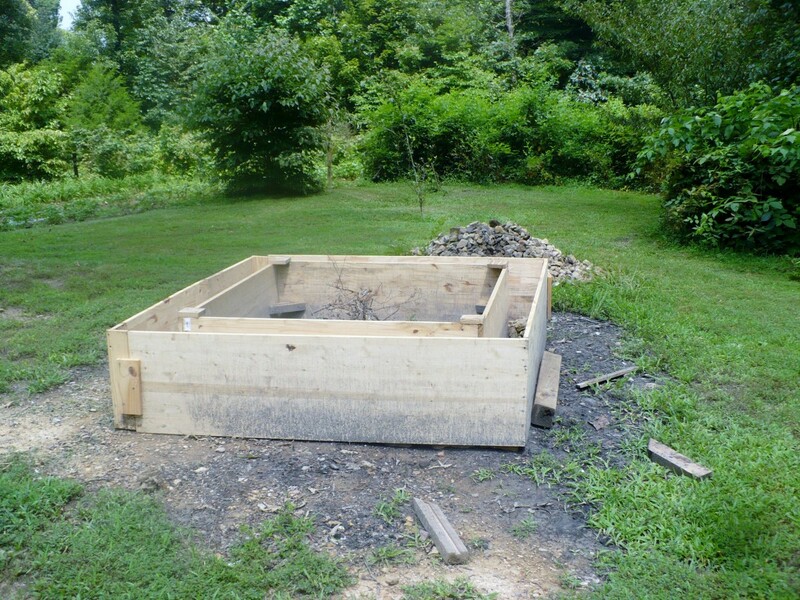 We smoothed off the top, and removed the frame and had our completed fire pit. Simple as that. If we had them, I would have preferred to use bigger, flatter rocks. 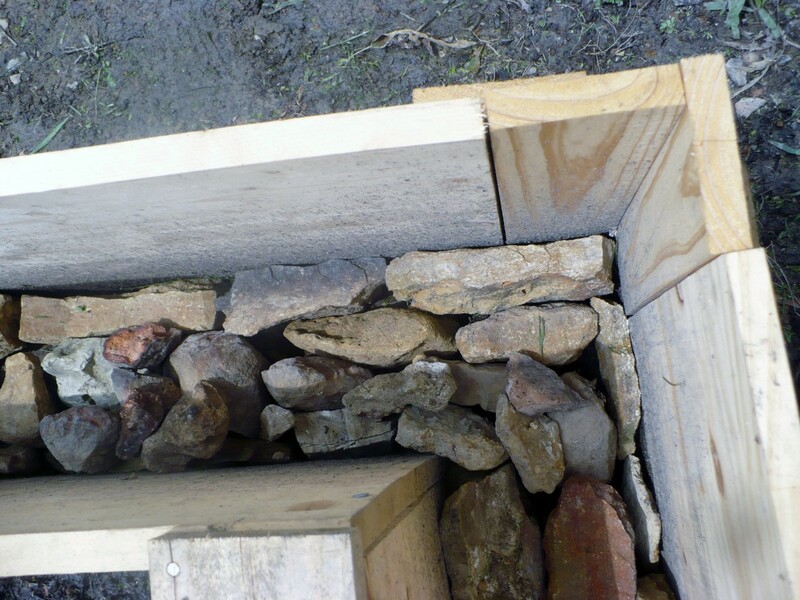 Most of the projects I have seen online use bigger, builder type stones. Many of our rocks were small, irregular field stones that were harder to use. But you use what you have. We decided as we were almost through that we should have braced our forms more. They began to bow out at the top. They're not terribly noticeable, though, and it's good enough for our purpose. 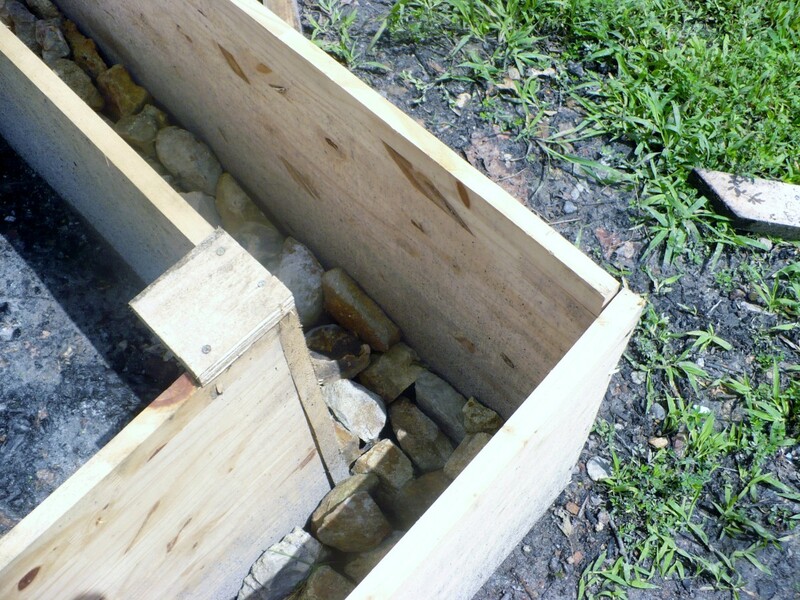 The other thing we might do differently is the type of mortar we used. It tended to get a little crumbled at times. We'll research that more if we attempt a project like this again. Since it was constructed, our fire pit has served us well. We have often used it for burning debris as we're clearing, and we have had many cookouts there since it was constructed. John and I were both retired when we moved here. Prior to that, we had spent our professional lives in offices and classrooms. We've lived here now for ten years, so we're not spring chickens anymore. We're amateurs when it comes to this type of project (and sometimes it shows). But learning and trying new things is challenging and helps keep us young. This is not a perfect fire pit. It bows a little in a couple of places and a few stones are loose. 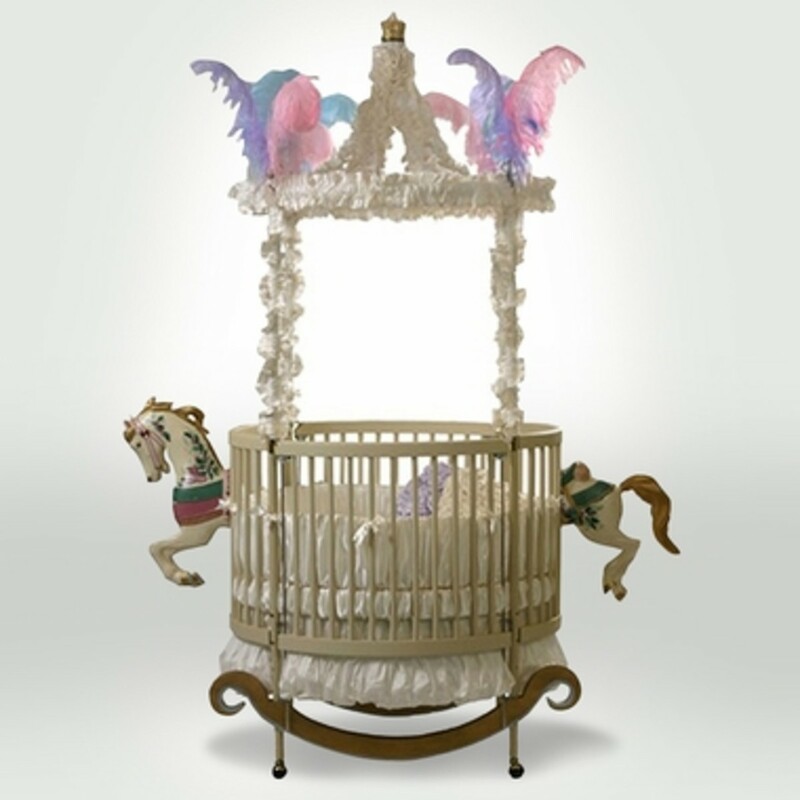 But we have received quite a few compliments on it, and we and our granddaughters all love it. It was a perfect addition to our little place in the country. Now I'm trying to decide what our next project should be. Any suggestions? If you want to learn to live more sustainably, here's a list of books to help you. 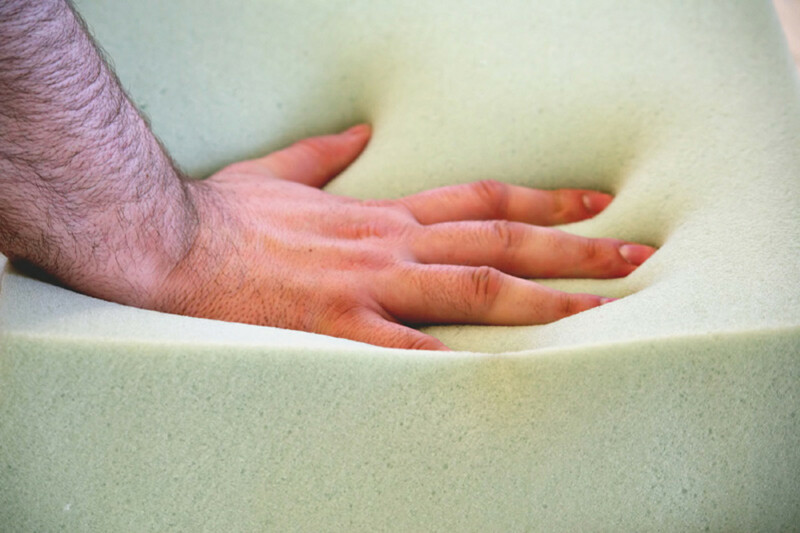 Want to save money on building your new home? This article will show you how. Learn how to contract all or part of the work yourself. 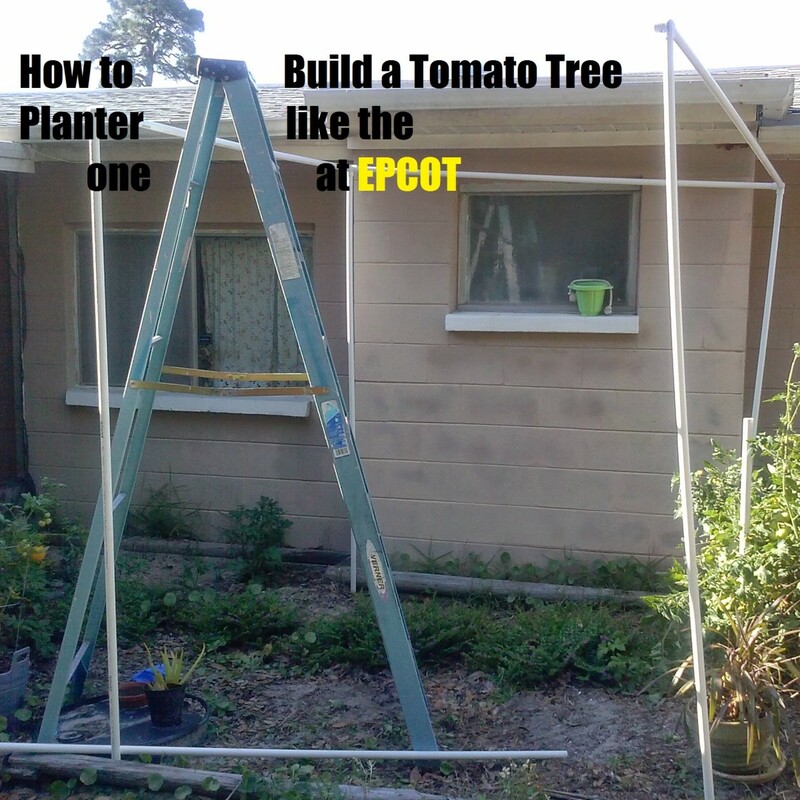 How to Build a Tomato Tree Plant Like Disneyworld's Epcot Ride "Living With the Land." I know what you mean; it brings back memories of when I was young, when before the days of BBQs (Barbeques) it was traditional in Britain to bung potatoes in the hot ashes of bonfires (campfires); especially on Guy Fawkes Night (5th November). Then an hour or so later the potatoes would be raked out of the hot ashes; by which time the outside would be burnt to a black crisp. We would then crack them open like an egg and put a knob of butter onto the mashed potato inside; as a campfire treat to finish off the evening. These days of course, the BBQ has replaced all that (even on bonfire night on 5th November). And, it’s the blokes who congregate around the BBQ (with their pints of beer) to do the cooking (which I assume might be similar in America), even if they don’t normally cook at home. Arthur, Glad you are continuing to learn--especially about s'mores. 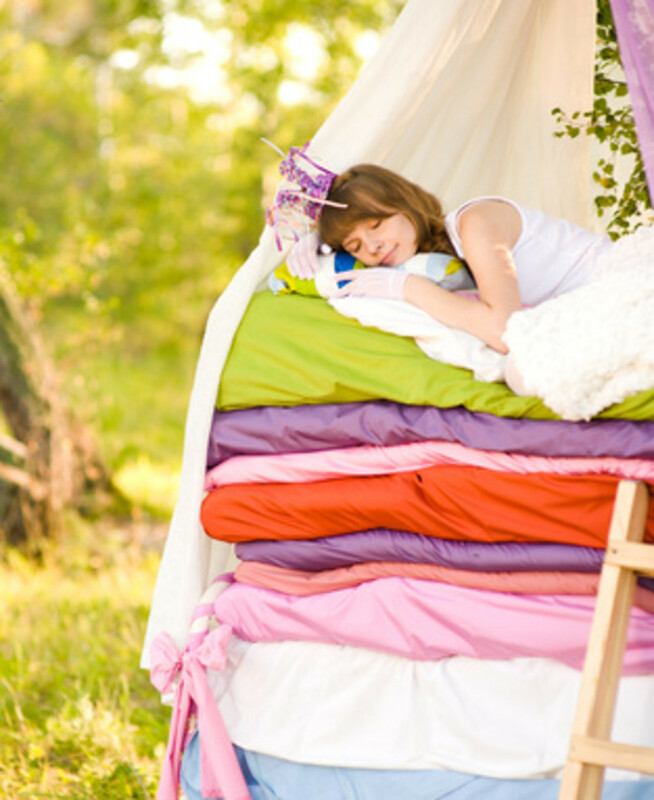 We usually only have these when the grandchildren are visiting, but everyone enjoys them. S'mores are about more than food. They're about campfires and campgrounds and friends and family and togetherness. I’m learning something new every day from you. I’ve never heard of s’mores, so had a quick look on Wikipedia for more details. We don’t have anything like that when we have a BBQ. I cook the traditional BBQ food for guests e.g. sausages, burgers etc., with fried onions and salad as optional to go into the bread and butter rolls. But as I’m a vegetarian I also bung a few soya based Linda McCartney’s Vegetarian Sausages on the BBQ for me; which I prefer to the Quorn sausages by other producers. However, a surprising number of meat eaters also like the Linda McCartney’s Vegetarian Sausages, so I end up putting more on the BBQ than intended. And in conjunction with the BBQ food we also do a small buffet, which includes a choice of savoury and sweet foods. We don’t have Graham Crackers in the UK, the nearest equivalent might be the Cream Cracker (a flat savoury biscuit invented by Joseph Haughton, Ireland and then manufactured by William Jacob c1885), or the Ryvita (a rye-based crispbread, first produced in Birmingham, England c1930s). Both the Cream Cracker and Ryvita are savoury foods, and best eaten with cheese e.g. a spread of butter with a slice of cheese on top. We came by Bristol when we were in the UK a few years back. We stayed in a B & B in a delightful little town called Bourton-on-the-Water. Visited Bath and other locations in the ares. It must be a lovely place to live. We are still enjoying our fire pit. Almost every visit by the granddaughters involves a campfire to make s'mores, a delightful concoction with graham crackers, chocolate, and roasted marshmallow. Intriguing article; and your fire pit looks really great. I’ve seen fire pits on American DIY programmes on the TV, but you don’t tend to see them in the UK; I think predominantly because British gardens tend to be much smaller, so we have to be more economical with the available space. My back garden is only 30 feet wide by 100 feet long, so although it would be nice to have one like yours we wouldn’t have room for it; albeit I did make space for a brick BBQ which we use periodically through the summer months. I too love the wild blackberries. Every August I stroll down to the Bristol to Bath cycle path (just a five minutes’ walk from our house) where the blackberries grow wild; then come back a couple of hours later with a couple of kilograms (about 5 Lbs.). I also love the countryside. When I was still at primary school my family moved to Uley in the Cotswolds; a small village (population about 1,000) surrounded by hills and woods, and a couple of miles from Dursley (the nearest town, with a population of over 6,000). Now of course I live in the suburbs of Bristol; large city in the West Country with a population of over 400,000; albeit only 25 miles from Uley. Although I now live in a city, I’m never far from the countryside, or green space e.g. where I live in the suburbs is just a mile from the green belt. The greenbelt, first proposed in 1935 was formally introduced by the Labour Government in 1947, and reinforced by the Conservative Government in 1955. The Green Belt is a boundary of green land surrounding each city and town, where development is prohibited, specifically to prevent urban sprawl. In fact the city of Bristol is only 10 miles in diameter so nobody in the city is ever very far from the countryside. Also, Urban Green Space has been successive government policy since the 2nd world war. Under Urban Green Space policy local governments are required to ensure a significant proportion of land in the urban area is ‘green space’ e.g. 29% in Bristol and 40% in London, which includes parks, woodland, lakes etc., and that every resident lives within walking distance of ‘green space’. The concept of urban green space policy is the belief that it’s essential for the health and welling of city dwellers. Therefore, although nothing beats being in the countryside, it doesn’t matter where I am in Bristol (or any other city in the UK), if I want half hour of peace and tranquillity I know that there’s somewhere nearby where I can relax and be away from the hustle and bustle of city traffic. Thanks, Bill. I'm going to write a new hub one of these days soon. I know what you mean by too many projects. It seems to be my job around here to come up with new projects for us to do. I love it all. teaches12345 , It has been used for that purpose many times already. Thanks you for reading and commenting. I can just see me roasting marshmallows over this pit. Thanks for the idea and information. MsDora, Thank you for reading and for the good wishes. FlourishAnyway, I hope you get your firepit. We use ours often. Thank you for sharing your dream of the good life, and the story of your fire pit. Happy for you that you found someone to share your life. All the best going forward! I would love an outdoor fire pit such as this. I particularly enjoyed your photos and lessons learned. billybuc, Thanks. It was a fun project to do. Very cool! I love to read about people realizing their dreams. Well done!